In trying to achieve our mission of a healthier and more diverse urban forest in our region, we've learned that pictures can be more impactful than words. 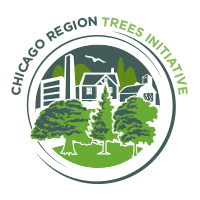 That's why we were grateful when Chicago Region Trees Initiative partner, Bluestem Communication, offered to tell our story with the use of infographics. The data we've been collecting in the region on canopy cover, tree species composition, and modeled benefits of our trees were artfully presented in a series of infographics to help us make a case for trees. The first infographic, "Chicago's Urban Tree Canopy Has Room to Grow," presents a comparison of where tree canopy exists in our region and where it is needed. The second infographic, "Chicago Region's Tree Canopy Under Threat," explains factors that are reducing the extent of canopy cover in our region, such as invasive species, poor oak regeneration, and climate change. The third infographic, "Trees are a Person's Best Friend," reminds everyone why we care about thr loss of trees, including carbon sequestration, flood reduction, energy savings, air filtration, and noise buffering- including the financial value of these services. You can find each of these infographics here. If you find this series valuable, we hope you'll share them with friends, family, and even your local elected officials! The trees in this region need your help- please consider planting trees in your yard, advocating for trees in your community, or volunteering to steward the parks and natural areas around you.